Telescope: 10-inch f/4.5 reflector Magnification: 183x FOV: 0.38º Transparency: Fair to poor Temperature: 85º Humidity: 55% Dew Point: 67º NELM: 5.0 A surprisingly clear sky summer sky for the foothills of North Carolina. However, the humidity was very high, reducing the transparency considerably. Very easy to locate and see at low power, but lacking detail. The seeing was good, therefore allowing the use of 183x. The galaxy is well concentrated, but appeared fairly dim due to the poor transparency. Highly elongated with the NW being much brighter than the SE. When using averted vision, the texture is uneven with mottling. A very subtle elongated brightening in the central region, but no core. A semi-circle of five faint stars lies just south, making a curve toward the west and going well beyond the galaxy. The following is a “rough field sketch” using a No. 2 pencil and a blank 5 x 8 notecard. Colors inverted via computer. NGC6503 is a 10th magnitude spiral galaxy located in the constellation Draco. The galaxy is relative easy to find. The stars Chi Draconis (magnitude 3.6), Omega Draconis (4.78), 27 Draconis (5.1) and Aldhibal, aka Zeta Draconis (3.2), all lie roughly on a line. NGC6503 resides on the same line between the stars Chi and Omega. It is roughly at the midpoint between Chi and 27 Draconis. Because of its northerly declination, NGC6503 is circumpolar for most northern hemisphere observers. Even here in Kauai it doesn’t set; although it is only two degrees above the horizon at its lowest elevation. 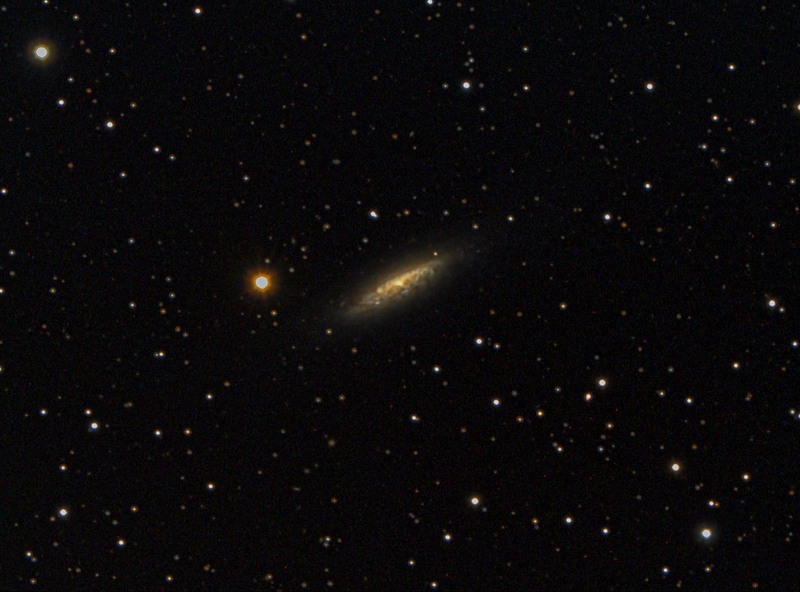 I first spotted NGC6503 this month with my 6-inch f/6 achromatic refractor. Since I used a GOTO mount in was in the eyepiece with little effort. 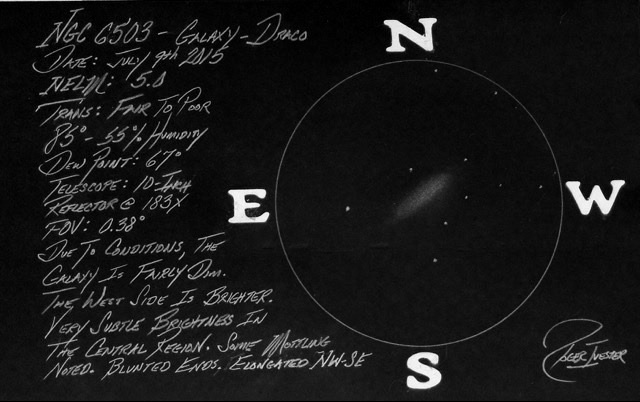 With the 6-inch scope, the galaxy was very faint and looked like an faint elongated patch. Pointing the red dot finder on my 14-inch f/6 Dobsonian at the correct location, I could not make out the galaxy in the adjacent 8×50 finder. But it was dead center in the scope’s eyepiece. Finding it was actually just as quick star hopping with the Dob as it was with the GOTO mount with the refractor. The Dob revealed a tiny bright spot in the nucleus, but not much detail in the galaxy beyond that. A red giant star, HD163465 (magnitude 8.6), lies in the same field of view as the galaxy providing some good contrast. NGC6503 is a member of the local group of galaxies. It lies 18 million light years away. The galaxy spans 30,000 light years making it roughly one-third the size of our Milky Way galaxy. The galaxy is 5.9 x 1.9 arcminutes in size with the major axis running northwest to southeast. The apparent elongation is because the galaxy is closer to edge on than face on. This entry was posted on July 17, 2015 at 6:04 pm and is filed under Work File Only - Observer's Challenge Reports. You can subscribe via RSS 2.0 feed to this post's comments. Both comments and pings are currently closed.